A while ago a good friend of ours made an amazing salad. My socks were literally blown off by how amazingly good it was – it tasted fresh and fulfilling and I wanted more. Unfortunately he can’t remember what went into it in order to give me the recipe. So I have come up with my own version. Tada! I remember quinoa, mint and feta. The rest I’ve come up with to try to fill in what I think would work – and we got to use mint and flat leaf parsely from our balcony herb garden which was lovely. I may post about our herb garden at some point because we have tried a few different methods and have finally found a method which is really working well. Welcome to my delicious Thursday night feast. 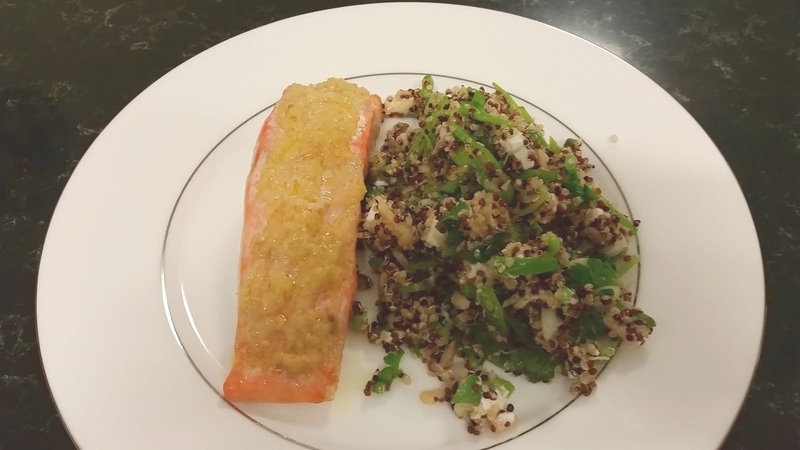 I decided to pair it with a baked ginger and garlic salmon for night one, so have included the salmon in the recipe – it worked a treat. On night two we had it with steak, and on night three we had it with chicken breast rolled in Greek Yiros seasoning and some blanched broccoli with slivered almonds. It was gorgeous every time. This is going to be a regular in our household. Combine olive oil, garlic and ginger. Meanwhile, bring the chicken stock to the boil in a medium saucepan. Add the quinoa, pop the lid on, reduce the heat to low and simmer for 10-15 minutes or until absorbed. Turn off the heat and rest for 5 minutes, fluffing with a fork. 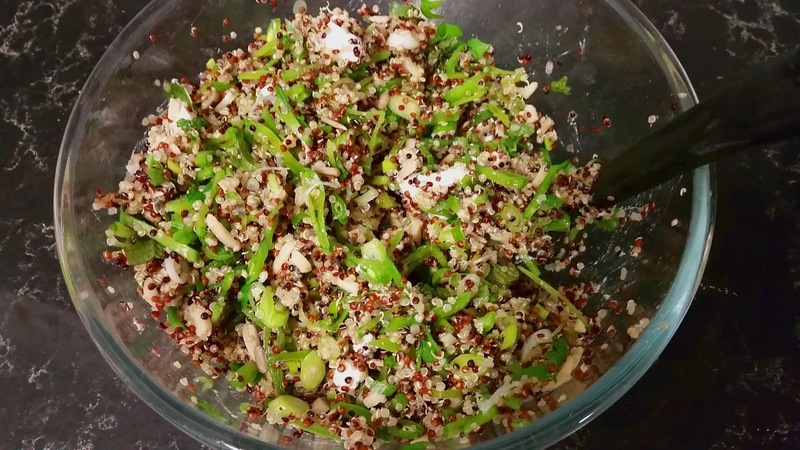 Combine the quinoa, snowpeas, shallots, nuts, seeds, feta and herbs. Stir to combine. Season with salt and pepper and dress with olive oil and lemon juice. isn’t the prettiest but trust me it tastes gooooood. Yum yum yum yum yum. The leftovers will keep in the fridge for a few days, covered with gladwrap. It tastes good both warm and cold. I recommend re-dressing with a squeeze of lemon juice on successive nights.